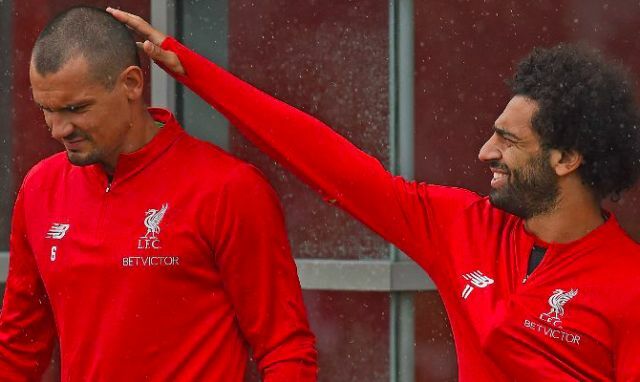 Dejan Lovren has been typically quick off the mark to ridicule teammate and close friend Mohamed Salah for his latest off-field venture. The Liverpool forward has been seen modelling high-profile clothing brands as the cover star for the latest edition of GQ Middle East magazine. His involvement marks further reflection of his rise as a global sports icon in light of his stunning impact since arriving on Merseyside. One image consists of Salah displaying his abs in an open shirt – much to the amusement of his fellow Red. The pair have built something of an unlikely ‘bromance’ during their time together on Merseyside, with Lovren having helped the Egyptian settle down following his return to England. Besides stepping into an unfamiliar role as model, Salah also took the time to discuss his tough route to life as a professional footballer, as well as adapting to new surroundings across his travels.